This block was one of those “great” ideas I get as I’m falling asleep and then I can’t sleep because I wanted to try it so badly. Unfortunately because I was so excited, I didn’t take the time to double check my midnight math and my block ended up being 5″ instead of 6.5″. The good news is that I’ve slapped a border on it and it will definitely be in my sampler quilt. The EXTRA good news is that I know the dimensions that you need to make your block the correct size. Don’t let it scare you. 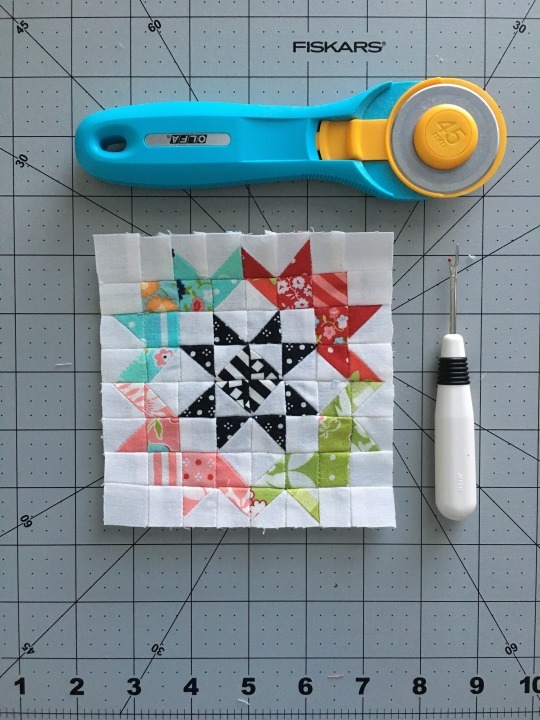 It really is easier than it looks and so fun to try tiny piecing!! If you’ve made a tiny pineapple, the pieces are the same size, there are just more of them. You can do it! If you’d like the coloring to be like mine (4 each corner and one in the center), you’ll need (6) 1 3/4″ x 1 3/4″ for the center and (3) 1 3/4″ x 1 3/4″ for each of the other 4 colors. You’ll also need (3) 1 1/4″ x 1 1/4″ for each of the 4 colors to make up 12 squares. Draw a diagonal line down the center of the 1 3/4″ x 1 3/4″ background squares. Pair up the background and print squares that are 1 3/4″ x 1 3/4″ and sew 1/4″ away from the center line on both sides of the line. Cut down the center line, press, and trim to 1 1/4″ x 1 1/4″. I HIGHLY recommend trimming. It is extremely important when using such tiny pieces. Lay out your block and assemble each row. Once again, I HIGHLY recommend laying it out and double checking you’re attaching the correct pieces oriented in the correct direction. Don’t let any of this scare you. It is so fun to make and such a feeling of accomplishment to use so many small pieces. Dutchman’s puzzle is a super awesome block whether you use a white background or use a printed background. It can make a great statement. The cutting instructions are for a white background as pictured on the top right. Draw a line down the center of all of the 2″ squares. Sew 1 2″ square onto each of the 8 rectangles, aligning the corner and sewing down the line. Trim off excess leaving 1/4″, press, and then sew on the remaining 2″ squares to make 8 flying geese units. Sew these into groups of 2, then lay out as shown and assemble your final block. The 4-patch star is a great block that can look completely different depending on how you choose to make your 4-patch. I chose to make mine resemble the stars in Thimbleblossom’s Summerville quilt because she’s a genius and why reinvent the wheel?? 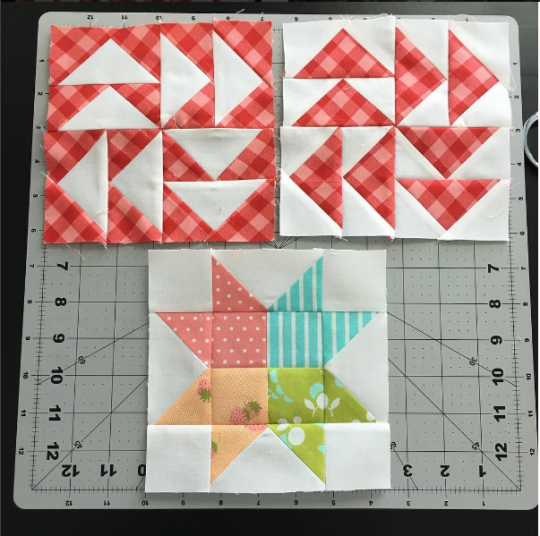 I highly recommend laying out your block first as it is super easy to mix up the square placement on your flying geese. You will use the exact same method as you did in the Dutchman’s puzzle to make your flying geese. 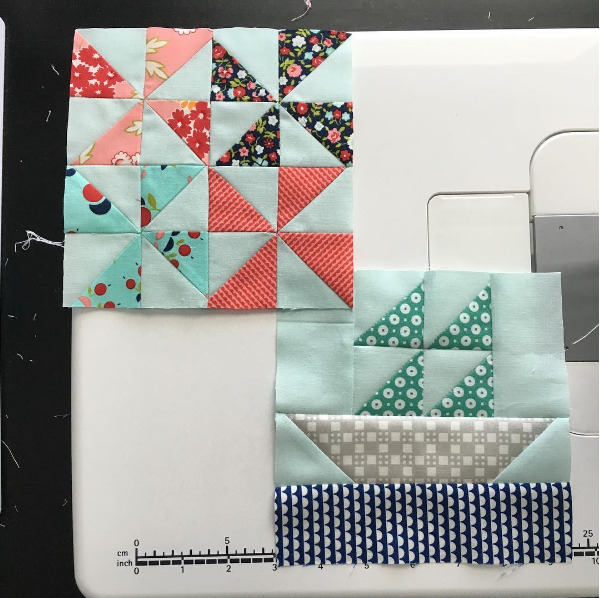 Sew together your 4-patch, then assemble your block.